A QR Code (short for Quick Response Code) is a matrix barcode (or two-dimensional 2Dcode). QR Codes are an evolution of traditional barcodes. There are two types of symbols: Micro QR Code or Standard QR Code. Micro QR Code is a smaller version of the QR Code standard for applications where symbol size is limited. There are four different versions (sizes) of Micro QR Codes: the smallest is 11×11 modules; the largest can hold 35 numeric characters. Standard QR Code can represent up to 7,089 digits or 4,296 alphanumeric characters. There are 40 versions of Standard Code: Version 1 through Version 40. (Mixed): default setting. Enables data encoding using a combination of all the following encoding modes based on the type of data found. Normally this setting produces the best results. Numeric: allows the encoding of numbers from 0 to 9. Alphanumeric: allows the encoding of numbers, uppercase letters, and some special characters. Best suited for alphanumeric codes with uppercase text. Hex (String): allows character encoding in ASCII. More suitable for alphanumeric codes with lowercase letters. Hex (Byte): specific encoding for byte data between 0 and 255. By using this encoding algorithm it is possible to encode any value between 0x00 and 0xFF (decimals 0 ~ 255). To use this encoding it is necessary to insert a string containing the two-digit hexadecimal values ​​separated by a space: Example: 32 FA 56 E8 12 … etc. Kanji: allows character encoding in the Shift JIS system used to display Japanese characters. 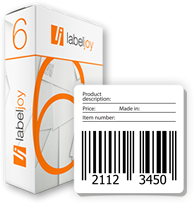 Labeljoy allows you to enter the minimum symbol size. The QR Code architecture displays the data in a square. The size of the square depends on the amount of data encoded. Normally the symbol is generated with the smallest possible size necessary to represent the encoded data. In some cases it may be necessary to increase the size to ensure that all printed symbols have the same dimension, regardless of the amount of data encoded. For example, if you connect a QR Code to an address field from an external database, you may need to set the size manually, regardless of the length of the single address, to ensure all the symbols are the same. M (default): 15% recovery capacity. QR Codes implement error correction to ensure readability of partially damaged symbols. The higher the error correction level, the larger is the symbol size needed to encode the same data.